The dangerous homemade drug “Krokodile” is composed of desomorphine and rots the user’s skin away, causes brain damage, and shortens life span. Brandon Slagle’s supernatural thriller “The Black Dahlia Haunting” stars Devanny Pinn and is based on the unsolved murder of Elizabeth Short. 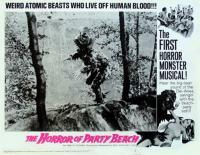 Del Tenney, cult 60s director of “I Eat Your Skin”, “Curse of the Living Corpse”, and “Horror of Party Beach”, has passed away. Are people losing their minds or is there a zombie virus loose? All about Canadian Psycho Luka Rocco Magnotta and the horrible, evil things he has done. Crazed killer Vince Weiguang Li decapitated 22 year old Tim McLean on a Greyhound bus in Canada. The Other Side: A look at Poltergeist 2 (1986) and Poltergeist 3 (1988). With Heather O’Rourke and Zelda Rubinstein.